To keep your home or business safe from wind, sun, rain and storms turn to Istueta Roofing, the roofing contractor Miami trusts for full service roof repairs, replacement and restoration. We offer a broad array of roofing services for all types and sizes of roofs. While other roofing contractors in Miami may offer you one or two roofing choices, Istueta Roofing has the resources and experience to install or repair all roofing systems, including shingle, tile, metal roofing and commercial roofing systems like built-up and single-ply membrane. At Istueta Roofing our focus is on making sure our customers are safe and protected in their homes and places of business. Each Miami roofing system we install is specifically designed to meet the challenges of our South Florida weather, with special attention paid to waterproofing and wind resistance. You’ll sleep better know that an Istueta roof is keeping you safe. Click on the links below to explore each of our services along with the brand name manufacturers whose products we install. We are committed to using only top quality materials and products when installing new roofs or making roof repairs. Our affiliation with the nation’s leading roofing manufacturers allows us to offer you the best products, at the best prices, installed by the best team of professional roofing contractors Miami has seen. 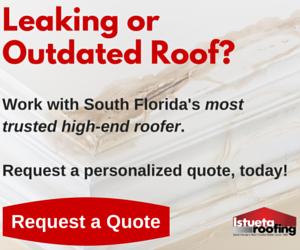 Since 1985 Istueta Roofing has been the roofing contractors Miami, FL homeowners have relied on for quality roofing and exceptional customer service. We are the best roofing contractor Miami has to offer. Get an estimate from the Roofing Contractors Miami, FL prefers! Call Istueta Roofing today at 305-266-1011 to schedule your roof assessment with the roofing contractors Miami trusts for quality and service. We look forward to serving your roofing needs! And when you’re looking for a contractor to work on your roof, download our “8-Minute Contractor Interrogation” worksheet to make sure you find a trusted professional to get it done right the first time.